Everyone grieves differently. Some bury themselves in work. Some go to counseling. Others take up a hobby. Shmuel, a Hasidic cantor, is grieving in a slightly unique way. He’s become obsessed with idea of decay and haunted by images of how his wife is decomposing. To each his own. To Dust is a thoroughly morose film, but it’s also an undeniably charming one. Géza Röhrig is best known for his starring role as an Auschwitz prisoner in the harrowing Oscar-winning film Son of Saul. His role as Shmuel is somewhat lighter in comparison, but he plays it with deep commitment and compassion. To Dust explores grief’s relationship to religion, with Shmuel plagued by obsessive thoughts that his Rabi views as sinful, which only compounds his grief. 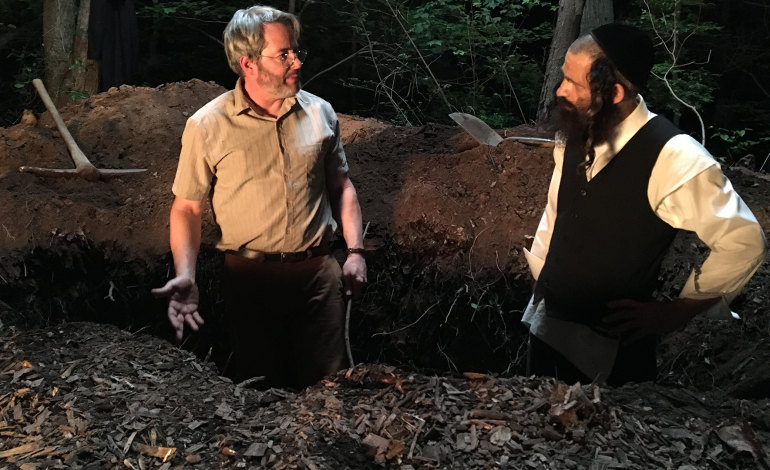 Seeking closure, Shmuel enlists the help of Albert (Matthew Broderick), a local community college biology professor, to help him understand decomposition. Death is the moment where the religious and the corporeal most overlap, so it makes macabre sense that Shmuel’s fears for the body and the soul manifest themselves in an obsession with physical death. Shmuel and Albert’s writer/director Shawn Snyder strikes a tone that is neither disrespectful nor reverential, having fun with the film’s conceit, but never loses sight of the religious implications. Shmuel’s obsession with decomposition leads him and Albert to experiment with burying pigs and eventually sends them on a road trip to a human body farm. While Shmuel and Albert deal with the corporeal, his two boys, Naftali (Sammy Volt) and Noam (Leo Heller), become worried that their mother’s soul has turned into a malicious spirit called a dybbuk, and is possessing their father’s big toe. Credit to Snyder and Jason Begue’s script for finding comedy gold in this Jewish graveyard. While Shmuel is the film’s emotional core, Albert is the audience’s shepherd, a role Broderick fills with reluctant aplomb in what is his best performance in years. Looking very much the community college professor, Broderick’s Albert is a portrayal of kinship borne of self-effacing loneliness. His sense of comedic timing is perfect and he lends some needed counterbalance to Röhrig’s performance. Röhrig proves himself a capable comedian in his own right, playing increasingly absurd situations with an emotional ferocity that makes the whole absurd operation work. The two play well together, and in a film that rides heavily on the back of their relationship, the casting needed to be perfect. To Dust isn’t quite as macabre as its premise would suggest. It’s a charming film about love and friendship that questions what we consider acceptable methods of grief. Röhrig and Broderick are both fantastic and I’d love to see more work from both of them. Snyder’s debut film isn’t particularly flashy, but it’s a masterpiece of town, balancing comedy with depth and emotional measure. He’s a filmmaker worth keeping an eye one and he’s made a film that is very much worth watching. If you’re in New York, you can see it at the Tribeca Film Festival.